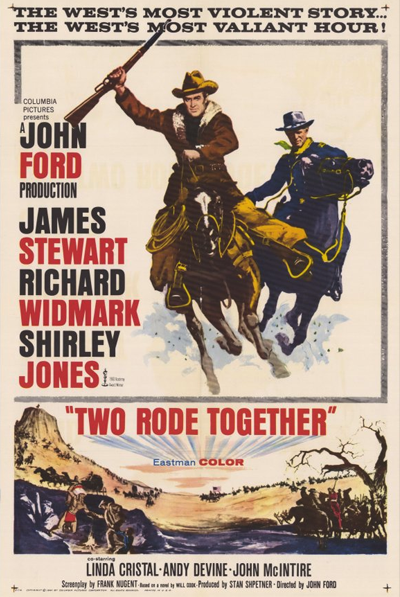 Today's feature is patriotic conservative Republican acting great James Stewart's first film to be directed by legendary Western director John Ford. It's kind of a follow-up of sorts to Ford's earlier Western classic, "The Searchers". Great movie. Seen it 20 times. Not on Netflix...grrrr. I love Ford, Stewart and Widmark. Ran into the same problem a couple of years ago when I went looking for it on DVD. My sister wound up downloading it off the internet and burning me a copy of it. This movie was filmed where John Wayne filmed The Alamo and the movie, Bandolero. If you notice the town is much the same in all three movies. I’ve been looking forward to this—thank you! There is a wonderful John Ford biography (amazon/local library?) narrated by Bogdonavich, Speilberg and Eastwood that tells of Ford’s style and film effects accomplishments. One — is his use of the “horizon line” — spelled out perfectly by Speilberg. As I remember the scene where Stewart and Ladd are alone by the river (I think one lighting a cigarette) is ad-libbed. Interesting. I’ll need to check that out next time I watch them. Widmark was at his best as a psyco bad guy. You had to believe he was the devil incarnate. I knew what you meant lol! Thanks! I’m not a film or literary critic. I just love good entertainment! Oh, geez, I hope I didn’t sound like I “think” I’m a film critic — I’m not. But, I do live in LA where talk of something about film, or stars or whatever is probably mentioned every day. Anyway that biography of Ford was so wonderful — his absolute love for John Wayne; shooting on location in Utah — said he had to get away from the “studio; and many, many scenes from our favorite films. Viewing it enhanced my enjoyment of old Westerns.